When we decided to throw an impromptu Super Bowl party, I headed straight to Pinterest for quick and easy yummy things I could throw together in a jiffy. 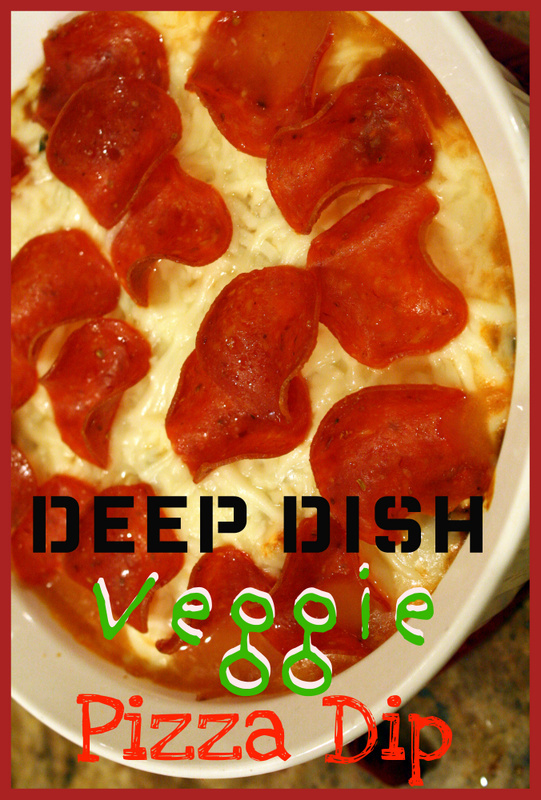 Pizza dip is one of those dishes that look easy and appealing to almost anyone, so I thought it would be a good option. But of course, you know I had to make it my own. It’s easy enough to replace all the cheese with light cheese for a slightly healthier version. 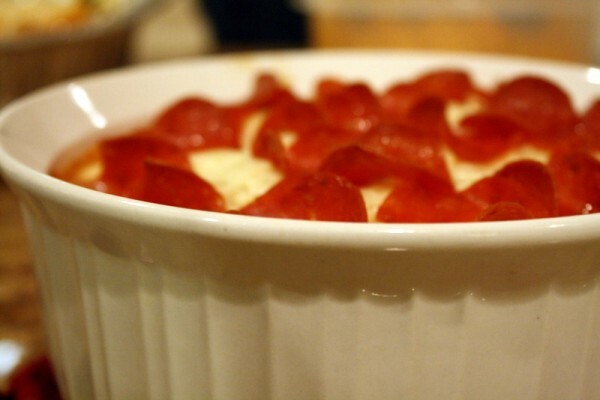 By using turkey pepperoni and including plenty of veggies, this recipe really ups the nutrition, fiber content, and general healthiness of this crowd pleasing appetizer. Most importantly: the addition of veggies doesn’t compromise the taste. Defrost spinach and artichoke hearts by microwaving in a microwave-safe bowl for 2-3 minutes or by removing from freezer an hour or two ahead of time. Pour vegetables into a colander and press slightly to remove excess water. Heat olive oil in a small pan and add bell pepper. Saute on medium heat until pepper has softened and begins to brown. Add cream cheese to vegetables in a medium sized pot and heat over medium heat, stirring until cream cheese has softened and mixture is completely combined (or place in a microwave-safe bowl and microwave for one minute, remove and stir). Add bell pepper and tomato sauce to mixture and stir. Place in a casserole dish (round or 8×8 dish). Top with mozzarella cheese evenly. 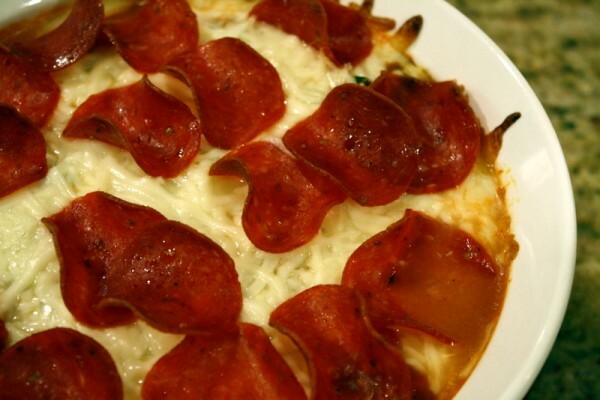 Layer pepperoni over the top of the dip. Bake for 20 minutes. 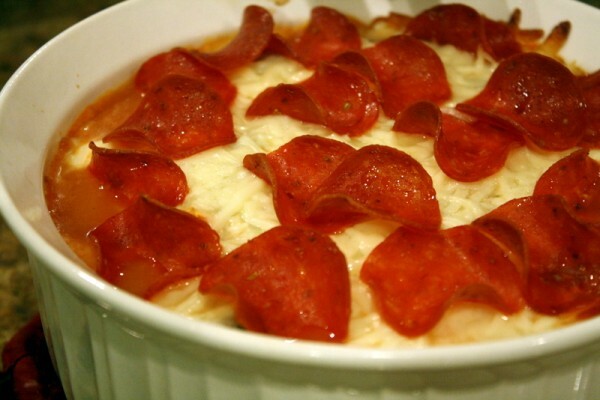 Notes: If you’re a meat love add up to 1/2 cup of turkey pepperoni to the mixture, when you add the tomato sauce. Or, forgo the pepperoni completely for a vegetarian version. I served this with a baguette that I cut into slices and toasted a bit with some olive oil. And do you know what to do if only three people show up to your party…the party you decided to throw five hours before the Super Bowl…and they all bring enough food for a crowd? You repurpose your pizza dip by eating it for breakfast with an egg white and spinach on a toasted English muffin. This dip is so pretty. I wouldn’t want to be the first one to stick my chip or veggie in! I love the idea of using the leftovers in an omelet. Oh gosh this is all of the perfect ingredients colliding. I need to run a mile right now just looking at that! Ah, sorry I missed the party and the DIP! Looks awesome! Must try it! Oh my deliciousness, this looks awesome! We picked up some turkey pepperoni to make calzones on Super Bowl Sunday and I reminded me how much I love ’em 🙂 We had some left over so I tossed them into an egg white and veggie scramble as well as made some pizza roll-ups… I’m thinking I’m gonna have to buy another pack!